Found 67 blog entries published by Client Care. Feeling the Call of Colorado? Wednesday, April 9th, 2014 at 9:17pm. Wednesday, April 9th, 2014 at 1:51pm. For those of you out there who may not be a fan of these furry critters, why not hear what the humane society has to say. Tuesday, March 25th, 2014 at 12:42pm. Great Audio Books For The Home Improvement Do-It-Yourselfer! Sunday, March 23rd, 2014 at 9:08am. Audio books are a great way to pass the time, especially when doing something time consuming and repetitive like driving across the country, running on a treadmill or painting and improving your home. In fact, what better way is there to enhance a boring project like remodeling a bath, weeding, vacuuming or doing dishes other than to figure out a way to be entertained by it in some way. Choosing a book that you can relate to, make you laugh, or share a few tips is just the thing you need the next time you are presented with a task that requires lots of motivation and time! Here are some of my favorite home improvement/Do-it-Yourself/real estate books that are sure to help pass the time. Fix it and Flip it... What you need to know! Wednesday, March 12th, 2014 at 11:08pm. Thursday, February 27th, 2014 at 3:43pm. Move It or Sell It, That’s the Question... and an Estate/Moving Sale is the Answer! Sunday, February 23rd, 2014 at 10:52pm. The winter season is almost over and in the real estate world this means that people are gearing up for the predominant buying and selling season. Inquiries always peak around the start of the new year and indicate an influx of people looking to relocate in the spring and summer. In preparation, many folks, especially those moving long distances or downsizing, will find it more beneficial to liquidate their belongings rather than moving or storing them. 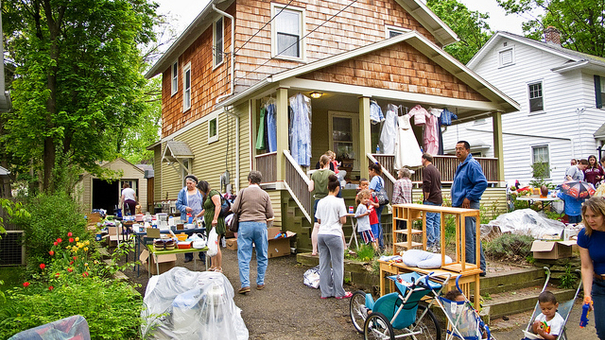 The choice now becomes how, where, and when do you sell your stuff if you are moving? The answers are below! Saturday, February 15th, 2014 at 11:14am. People who find themselves drawn to mountain life tend to do it for one reason, their love for the outdoors. When buying a mountain house, whether you are in the Foothills of the Rocky Mountains in Colorado or looking for an investment property near Big Sky Montana, mostly likely you will be looking for a home that features something that enhances the benefits of your surroundings. And, if you are fortunate enough to build or renovate your dream mountain home, the chances are good that you will take advantage of at least one of the following popular trends. Friday, February 7th, 2014 at 12:08am. Sunday, February 2nd, 2014 at 3:01pm. When we talk flooring, the sky’s the limit in terms of different options, styles, colors, and materials. In fact, the old days of wall to wall carpet have long gone and is being replaced by things like lightweight and highly durable bamboo, spongy and orthopedic cork floors, and more modern industrial concrete creations. Despite each new flooring's sets of benefits, traditional options like hardwood and tile also continue to be very popular. Even these classics have been improved upon and can offer way more than one could imagine that they would get from their home’s floor. Here is a little more information regarding the different kind of flooring options readily available at your local retailer.